Spring Hill, Florida is a great place to live. Learn more here. Are you looking for something to do this summer in Hernando, Citrus, and Pasco county? Check out these fun events in our area to get outside and have some fun during this hot and beautiful summer! If you like a challenge and that small-town feel, visit Sweetfields Farm for the Spring Harvest Sunflower Maze. This event opened a couple weeks ago but it will still be going on every Saturday and Sunday until June. This maze is sure to have you and your friends laughing and lost. Sweet Fields Farm feels like a leap back in time to where the crowds are small and the service is spectacular. The sunflowers are big and bright and up to ten feet tall! Bring a blanket and get settled because there is so much to enjoy at this beautiful farm. From the cute farm animals to the fun handmade games, this event would make a fantastic date or just grab your friends and head over for hours of fun for less than ten dollars! Your admission includes the sunflower maze, time to visit with the farm animals, a duck race, access to the adorable little picnic area, a web maze, and free crafts. There is also a digital scavenger hunt between noon and 2pm that you can participate in for free! Just bring your digital camera or phone to track your findings along the way! You can pay extra for various bonuses throughout your day at Sweetfields Farm like u-pick or freshly gathered produce, food and drinks from vendors, the launcher where you can shoot 3 vegetables across a field for $2 (try it, it’s so much fun! ), additional crafts, peddle tractor ride, and feeding the animals. Are you looking for something creepy to experience but don’t want to wait for Halloween? The May-Stringer Historical Museum is certified haunted and open for ghosts tours every Friday and Saturday night from 8pm to 10pm. The house that you will tour has over 150 years of history and artifacts, you never know what (or who) you may encounter! The war room in the home contains over 10,000 artifacts that have been donated over the years from the American Civil War and the Vietnam War. There is also a schoolroom that mimics the way a one-room schoolhouse would be set up. Skeptical? Hey that’s okay, go check it out and decide for yourself. This event would make for a unique date night experience. Grab your best friend or significant other and come prepared to be scared! Come learn about the “other side” of history in Brooksville. How do you feel about an open mic night outside under the beautiful oak tree of Florida? 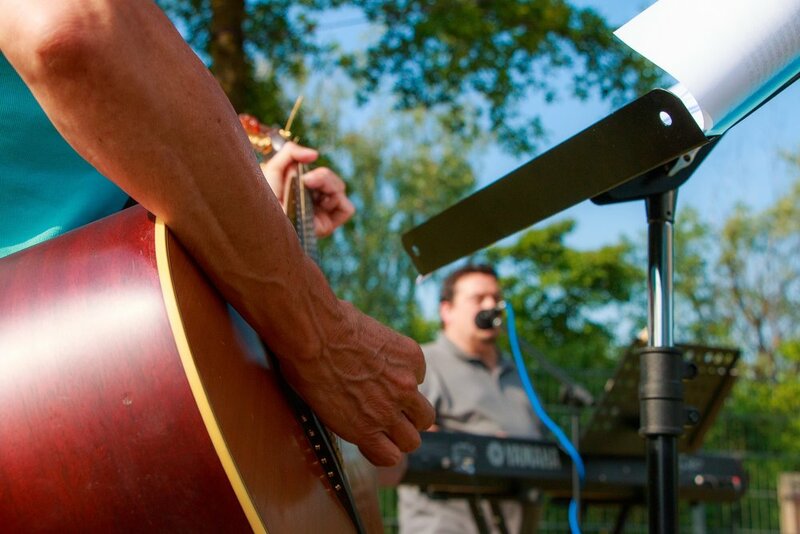 Bring your friends and outdoor chairs to enjoy a fun night of musical expression in the fresh air. You are also invited to bring your creativity, acoustic instruments, stories, songs, poems, and more! A dish to share with everyone is your admission! Check this event out make new creative friends and share your ideas and talents. Have you checked out the Heather Community Center yet? Every first and third Sunday of the month, you can go make crafts with friends and make new friends, too! Come early for a potluck lunch and then learn a new craft or teach your craft to another that is willing to learn. Work on your needlework project, practice a new skill, and enjoy light refreshments. Plus, it’s FREE! This event is a great opportunity to network with those that have similar interests. Do you love paintball but hate the pain after getting shot? This is the place for you! The Airport Farmers & Flea Market has a fun and challenging target range that will challenge beginners and skilled shooters. Bring yourself, your friends, or even host a birthday party or event! If you want to have a fun day of competition with your friends and family, head over there on the weekend this summer and shoot some paint balls with no bruises in the morning! If you are a more active person and looking for a great run to participate in this summer, check out the Annual Ernie Chatman Labor Day 5K. The run will take place on a flat, cross-country course that is shaded by the amazing oak trees and surrounds a lake. There will be a kid’s fun run after the 5k for the little ones to get active, too! You can get active and enjoy music, food, prizes, and age group awards. Pre-register to make sure that you will get a t-shirt at the event as well.